Dumfries is a lovely part of Scotland, a place where you can enjoy the quaint delights of the country. Dumfries is home to many beautiful buildings, many constructed from the characteristic red stone. Perhaps the most spectacular is Mid Steeple, dating back to 1708 and once the town tolbooth and prison. This has undergone a major restoration in recent years, and the image on this page shows the works on the surrounding paving almost at an end. Other notable red buildings include Dumfries Academy, the Municipal Chambers and Dumfries and Galloway Council Offices. Dumfries also has some great museums. 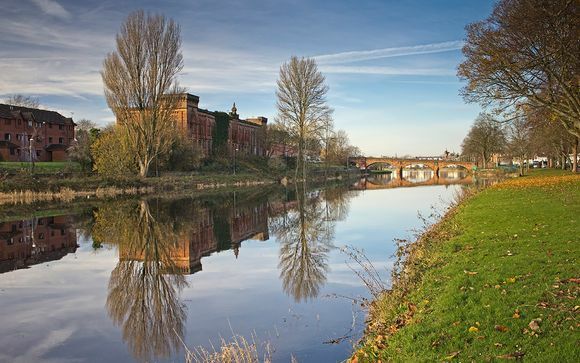 The excellent Dumfries Museum and Camera Obscura can be found atop a hill above the west bank of the River Nith and the Robert Burns Centre. This is built partly in a converted windmill. Meanwhile at the west end of Devorgilla Bridge is the Old Bridge House Museum, a series of remarkable collections of objects associated with aspects of life in Dumfries. And on the north eastern edge of the town is the excellent Dumfries and Galloway Aviation Museum. Comlongon Castle, near Gretna in Scotland, is a restored 15th Century Medieval Scottish Castle Wedding Venue and luxurious Baronial Hotel with 14 individually themed luxury en-suite 4-poster bedrooms. 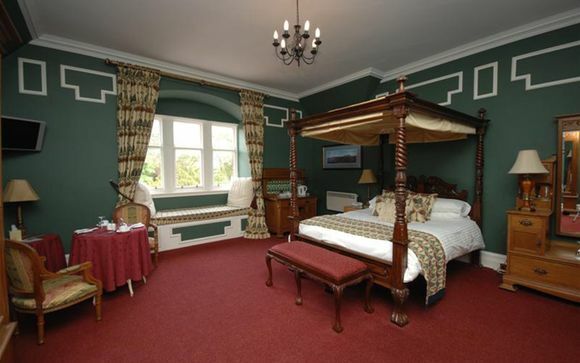 Steeped in Scottish Border history, Comlongon Castle has fantastic displays of Armour, weapons and banners, whilst the opulent bedrooms boast 4-poster beds and luxurious en-suite bathrooms providing a stunning blend of Medieval and modern luxury. Comlongon Castle is regarded as one of the finest preserved examples of a border stronghold. Built of pink dressed sandstone, with a rubble insert, on a wide plinth base, to act as a strengthener on what was once marsh ground. Measuring 50 feet square and standing 70 feet high, it retains many original and unusual features. The Great Hall, used as a meeting, living and banquet room, would have originally been plastered and painted with murals in vivid prime colours, depicting historical, religious and heraldic themes. Around the walls at ceiling level are some fine examples of stone carved corbels, bearing arms of families connected with the Murrays through intermarriage. Above the fireplace is an early 15th century royal coat of arms. All these carvings were at one time highlighted with coloured paint. The western side of the hall is dominated by the huge open fireplace, an original lintel (long since gone), was replaced by a wooden beam unequal in length, propped up on one end by a carved pillar. Above the lintel is an unusual carved overmantle depicting various plants and heads emanating from a dragons breath, believed to depict the ancient Celtic legend of the green man, or god of spring. To the right of the fire is a small dressing room where the laird would have changed into a variety of outfits, to entertain a constant stream of business delegations and social guests. This offer is based on a Four Poster Suite. All rooms are individually themed and decorated with en-suite bathrooms, contain tea and coffee making facilities (although staff will deliver these 24 hours if requested), Digital free view flat screen TV, ironing facilities and direct line telephones. We also offer free Wi-Fi services to guests. This offer is based on a bed and breakfast stay. Just for you: bottle of prosecco, hand-made chocolates. The castle hotel has two award winning oak panelled restaurants for receptions and a private resident's bar. Chefs specialise in local produce, changing their menus daily. Beware that most Sat Nav systems seem to send motorists the wrong way! If in doubt please call the Castle on 01387 870283 before visiting.